Mercy James went for the gold, and came back with four! Madonna's 10-year-old daughter totally swept the competition at a recent gymnastics meet, taking home multiple prize-winning medals. The pop singer shared her proud mama moment on Instagram Sunday with a few sweet snapshots of the little girl in all her glory. "Mercy James takes home 4 Medals," Madonna captioned a photo of Mercy beaming from ear to ear, adding quite a few congratulatory emojis to the mix. A second photo features Mercy and her team raising their arms in excitement while standing on the podium, and is captioned, "Go Mercy James!!! It's all about team Work!" Madge sure looks like she has a mini Simone Biles or Laurie Hernandez on her hands! Too cute. The "Hung Up" songstress plays mom to three other kids, 20-year-old Lourdes Leon, 16-year-old Rocco Ritchie and 11-year-old David Banda. 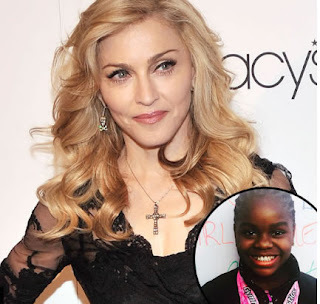 Madonna adopted both David and Mercy from Malawi in 2006 and 2009, respectively. She's since gone on to launch Raising Malawi, a foundation benefiting impoverished orphans in the country. Over the weekend, Madonna raised over $7.5 million for the organization at a charity auction and gala during Art Basel in Miami. The recording artist called on fellow celebs and attendees Ariana Grande, Sean Penn, Chris Rock, Courtney Love, Paris Hilton, Real Housewives of New York City star Bethenny Frankel and model Karolina Kourkova to help with the cause. Congratulations to Madonna and Mercy James on a weekend well spent!